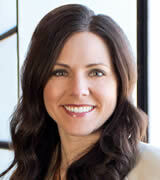 Ashley Bowen Cook, vice president at Greteman Group - a marketing communications agency based in Wichita, the Air Capital. hen charting your course, consider where you’ve been. But don’t dwell on those experiences. Bogging yourself down in what was hinders thoughts of what can be. Position yourself carefully and purposefully with knowledge of the past and a vision of where you want to go. Think of Janus - ancient Roman god of beginnings, transitions, and endings - depicted with two heads, one viewing the future, and one peering into the past. Learn from his balanced approach. He does not appear confused, but centered by insight. It can be the same with your marketing. A successful strategy considers both past experiences and future hopes. And then, launches with confidence. 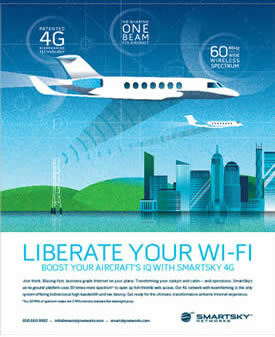 SmartSky Networks began a journey of a lifetime in 2009. It brought together a team of industry-leading telecommunications and aviation professionals to launch an inflight connectivity revolution. They built on past successes but stayed open to new ways to overcome entrenched competition. This future-forward focus puts them on track to for a 2017 nationwide network roll out. Take stock of the current situation and ask the relevant questions about how you arrived at this juncture. Who was the intended audience? What was the message? Did you make the hoped for connection? Answer with unflinching honesty and don’t gloss over failures. Apply lessons learned along your long and winding road to correct or to confirm your direction. Executive AirShare got its start in 2000, growing out of a highly reputable fixed-base operation in Wichita, Kansas. Now the nation’s third-largest fractional aircraft provider, AirShare doesn’t limit itself to the nation’s heartland. From its operational centers throughout the Central United States and Great Lakes regions, customers fly all over the United States and into the Caribbean, Mexico, Latin America and Canada. It’s grown by developing a do-it-right, get-it-done culture that puts shareowners first. Prepare for the road ahead. Figure out what kind of creative will be deployed. Consider what worked before. What life can be infused into the strategy. Plot a strategy for leveraging social media and other integrated marketing platforms. Employ a thorough, critical review. Stay on track. Keep the list concise and focused. The way forward will be clear. Aviation Partners stands apart as a leader in advanced winglet technology. 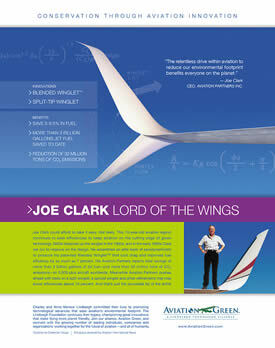 Founder, CEO and aviation legend Joe Clark continually seeks efficiencies to keep aviation on the cutting edge of green technology. 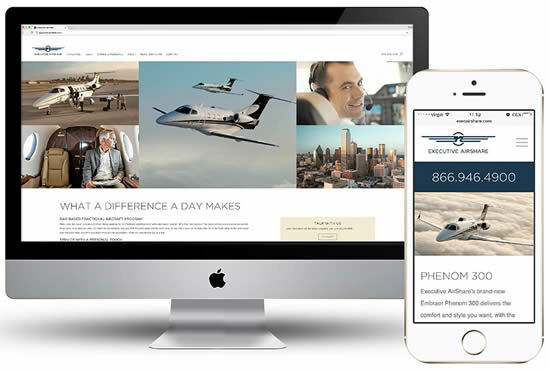 That effort extends to Aviation Partners’ outreach, appropriately targeted to its tech-savvy and highly mobile target audience. Rainy days come. Draw from previous wins to maintain motivation and stoke energy for you and your team. Recall the greatest risk that reaped a monumental reward. Let these experiences spur you on and keep the project moving forward. They can keep you from stalling out or worse - kicking into reverse. 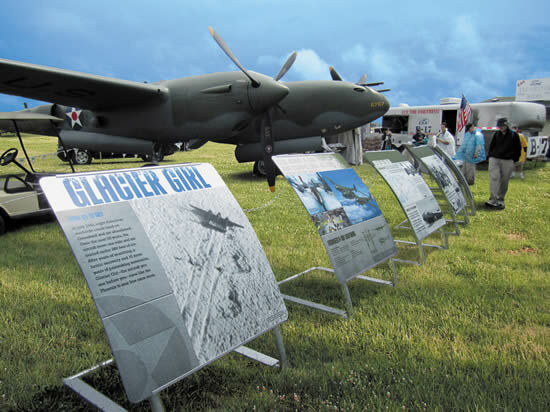 Perhaps nothing underscores the value of perseverance more than Glacier Girl, the jewel in Rod Lewis’ impressive Air Legends warbird collectioin. In July 1942, this aircraft (and seven other warbirds), low on fuel, crash-landed on Greenland's vast ice cap. In 1992, Glacier Girl was taken from its wheels-up position, removed section by painstaking section through shafts carved 25 stories (268 feet) into the ice. The sole rescued survivor of the entire squadron. Since returning to the air in 2002 before a crowd of 20,000, this P-38F Lightning has thrilled thousands more at air shows and events. Draw upon the insights of others. Collectively, your teammates know more than you. Collaborate and aha moments will come. Take the time needed to share knowledge so you learn from and don’t repeat mistakes. Look back at your best work, but don’t live on past glory. Face forward and you may find your best work before you.